Incomparable natural beauty and the Cariocas, laid back lifestyle and surprises in every corner of the city; Rio is a place to be this year for travellers looking for fun, thrill, adventure and peace. Dramatically set between the mountains and the sea, Rio is home to so much. The world-famous beaches of Copacabana and Ipanema, the city also houses major landmarks including the Christ the Redeemer Statue atop Corcovado mountain, the winding streets of beautiful Santa Teresa, the Lapa Arches, countless historic theatres, acclaimed museums and art galleries. Even though Rio is football crazy, this city has a lot more to offer. Get a train to climb you up the Corcovado and get to see Rio’s symbol of Christ the Redeemer and a spectacular panoramic view of the city. To be more adventurous, grab a map and get there on your own through the Tijuca National Park which is currently the most extensive urban forest in the world and home to wildlife and 30 beautiful waterfalls. Visit one of many museums such as Museum of Modern Art, the Museu Nacional de Belas Artes, and the Imperial Museum of Brazil or be impressed by the Real Gabinete Português de Leitura, one of the world’s most remarkable libraries. There are a few essential experiences that you wouldn’t want to miss, regardless of whether you are a party animal or a silent admirer of the surreal landscapes. There are many ways to go rolling in Rio and to that too in style. Up in the hills that surround Rio is a little town called Santa Teresa. The bohemian town is populated with artists and provides an excellent view of the city and its bays. Getting to Santa Teresa, via the tram or bondinho, one of the world’s oldest street railways, is an experience in itself. The pace is less frenzied and it doesn’t feel part of Brazil’s most happening city. Prime postcard material beautifully set in an otherwise entirely postcard-worthy city, the 600-million-year-old, granite-and-quartz peak of Sugarloaf mountain is not only a ‘registered trademark’ of Rio, but it stands as a beguiling, bold monument to Brazil’s nature, history, and tourism. 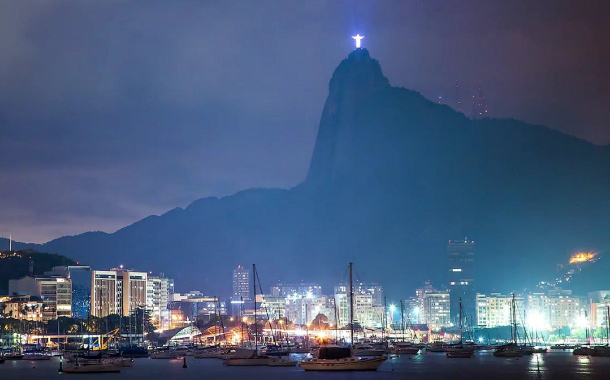 Jutting out of the Atlantic like a stony sentinel, the mountain affords mesmerizing views of the city, the ocean, Guanabara Bay, and the many green-covered mountain droplets that rise within Rio’s panorama. Earmark your Sunday for Rio’s beaches. Beaches are an integral, colourful part of the Carioca’s life. Yes, there are women in bikinis and men with ripped bodies, but there is also a lot else going around. Soccer volleyball games, for instance, in which the players don’t use hands but just count on their head, chest, feet and legs. It’s a fun site to see how players use their creativity to play around this game. When in Rio, do try the feijoada, a blackbean stew made with pork, a Brazilian specialty served with garlic rice, vinaigrette and toasted cassava flour. The Brazilians love to snack the pastel, a fried pastry stuffed with cheese and tomato, or shrimp and cheese fillings. The feijoada and pastel are absolutely a gastronomic wonder together. There is something very similar between India and Brazil –the slums. There are over 700 favelas or urban slums in Rio and 1.5 million people stay in them. Until about a decade ago, the favelas, which stud the hills around Rio, were off-limits. They were dangerous places to be in and the city was ashamed of them. But, since the last eight odd years, the favelas have changed, both with help from the authorities and the initiative taken by the people who stay there. I went to the favela of Santa Marta and saw brightly painted buildings, crèches, police, and a silent hope springing anew. 1. Rio Carnival is on every traveller’s bucket list. Catch this epoch making carnival before the Lent every year. You will be amazed at the energy, enthusiasm and myriad of colours manifested at the event. 2. Be well equipped with your beach accessories- a pair of swim wear, sunscreen and glares. 3. The city is tourist friendly. But it is advisable to stay in groups and avoid carrying any valuables on the streets. 4. Use a taxi to get around the city. They are the easiest and the most convenient way to commute. 5. Stay at a boutique hotel in Santa Teresa if you love bars and bistros. 6. Spend a night in Rio samba dancing with the locals at a popular club.